Sublime Photos of African Wildlife Roaming Their Lost Habitat – Nick Brandt’s book “Inherit the Dust” is a stark call for conservation. As an ardent conservationist, photographer Nick Brandt’s early work showing the majesty of the large animals that once ruled East Africa wasn’t enough. Brandt created three gorgeous photo books focused on African animals in danger of extinction: On This Earth (2005), A Shadow Falls (2009) and Across the Ravaged Land(2013). As a result of that work, what he saw, and what he learned, in 2010 he created the Big Life Foundation with conservationist Richard Bonham. Big Life protects more than 2 million acres of the Amboseli-Tsavo-Kilimanjaro ecosystem in East Africa. Brandt’s new project, Inherit the Dust, pushes his photography further to help visualize the impact poaching and development has on wildlife. Inherit the Dusthelps viewers see areas where elephants, giraffes, lions and other animals once roamed by placing 30-foot panels with photographs in the now industrialized landscapes. You see elephants sauntering through large dumps or under overpasses, giraffes blending in with machinery at mining sites. It’s a striking and effective technique. The book includes 68 images that, though admittedly repetitive in their execution and style, are no less impactful. 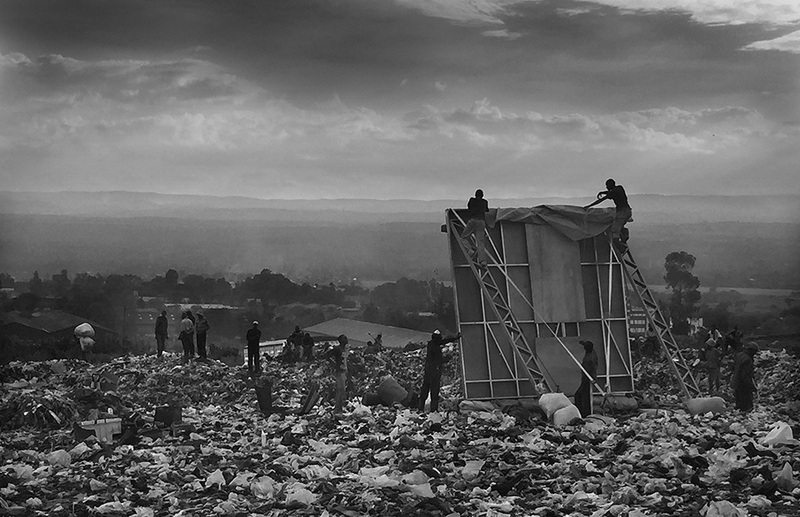 Brandt punctuates his argument with Inherit the Dust‘s sweeping, somewhat painful panoramic photos. 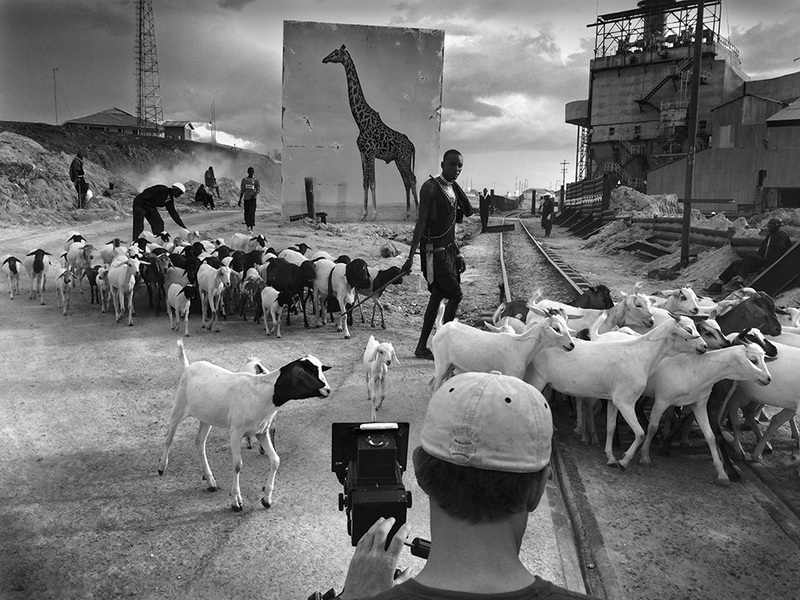 All photos by Nick Brandt, Courtesy of Edwynn Houk Gallery, New York. Photos from Inherit the Dust are on exhibition at Edwynn Houck Gallery in New York (March 10 to April 30, 2016); Fahey Klein Gallery in Los Angeles (March 24 to May 14); and Camerawork in Berlin (May 12 to July 8). 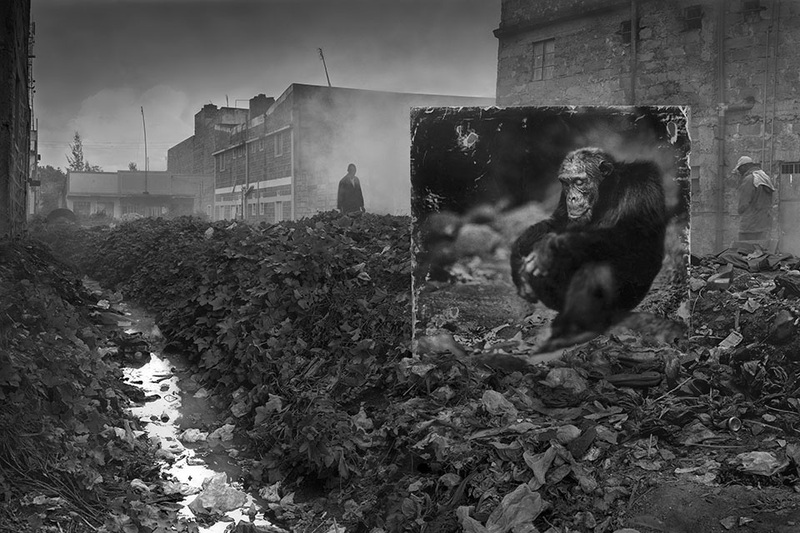 Nick Brandt is a featured speaker at this year’s LOOK3 Festival of Photography in Charlottesville, Virginia (June 13-19). Go to biglife.org to learn about the work that Big Life Foundation, the organization Nick Brandt co-founded in 2010, is doing in this regard.